Fig. 254, Fig. 267 and Fig. 227 Hopper-Equipped Eductors are made for handling slurries or dry solids in granular form and are used extensively for ejecting sludges from tank bottoms, for pumping sand from filter beds and for washing and conveying granular materials. Liquid under pressure issues through a converging nozzle in the eductor and produces a high-velocity jet. This creates a suction in the body of the eductor and causes the suction material to be drawn into the eductor and entrained by the liquid. Both the motive liquid and the entrained material are intimately mixed in the throat of the eductor and are discharged against some backpressure. Hopper Equipped Eductors are excellent for mixing dry product that is difficult to combine into a solution. Fig. 254, Fig. 267 and Fig. 227 Hopper-Equipped Eductors both mix and pump solids using no moving parts and only a pressure liquid for motivating power. They are easily made from any machinable or castable materials and require little or no maintenance. Handling granular solids and combining into solutions. Used to wet down gelgard, use for aerial firefighting in chemical processing plants. Carbon transfer and waste carbon system. Mix dry powder into solutions. Batch mixing of dry powder in tank feeds. Eliminate need for mechanical mixers in tanks. For more detailed info about Hopper-Equipped Eductors, Bulletin 2M & Bulletin 2M Supp. Literature. Application of Fig. 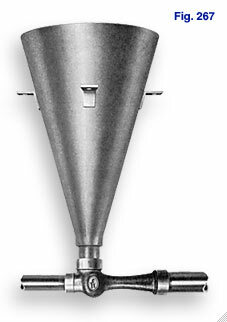 254 Solids/Liquid Hopper Eductor Handling Granular Solids and Combining into Solutions.